Today in Masonic History Frederick Dalcho passes away in 1836. 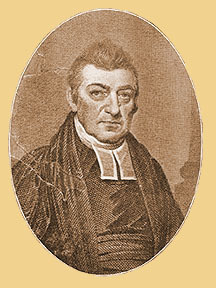 Frederick Dalcho was a British-born American clergyman. Dalcho was born sometime in 1770 in a borough of London, England. When he was nine, his father passed away. It was not until the age of 15 that he would move to Baltimore, Maryland to live with an uncle to pursue his education. He received his medical degree from his uncle's Medical School in 1790. After attaining his medical degree, Dalcho joined the Army as a surgeon. He served for several years and eventually resigned in 1796 to sign on to a private ship on which he mad several journeys to Africa. Dalcho had a major effect on Freemasonry in South Carolina. In 1801 he would become a 33° Ancient Accepted Scottish Rite mason while he was helping to form the Supreme Council, Southern Jurisdiction at Charleston. He would serve as the first Lt. Grand Commander of the organization. Dalcho was widely regarded as outstanding orator and would often deliver speeches about the fraternity and the history of the organization. He would highly stress that the ideals of Freemasonry were important not just within the fraternity. That they applied to the daily lives of the members of the Fraternity. In 1807, Dalcho published the Ahiman Rezon for the Grand Lodge of Ancient York Masons for the state of South Carolina. He would later bring the Ancient York Grand Lodge and the Grand Lodge of Free and Accepted Masons of South Carolina together to form The Grand Lodge of Ancient Freemasons of South Carolina. Dalcho would often work as a bridge builder both inside and outside the fraternity. Unfortunately this would cause irreparable damage between the man and the fraternity. In 1823, Dalcho became embroiled in a conflict between the Ancient Accepted Scottish Rite, which Dalcho was the Sovereign Grand Commander of at the time and a new organization which had been established in Charleston called The Sovereign Grand Consistory and Supreme Council of the Thirty-Third and Last Degree of the Ancient Scottish Rite of Heredom. This was not uncommon for conflicting Scottish Rite organizations to pop up in the beginning of the Scottish Rite. There were no real controlling bodies at the time and the origins of Scottish Rite itself is somewhat vague. Regardless the organization came into competition with the Dalcho's Scottish Rite, competing for the same blue lodge members. This caused factions to form in the lodges. People who Dalcho had long considered friends and brothers turned on him and as was reported not only by Dalcho, but by many Freemasons of the time, that they behaved in an unmasonic manner. Although Dalcho's efforts eventually brought the two organizations together, the damage was done. Dalcho resigned from Freemasonry feeling that the ideals of Freemasonry that he so strongly believed in, no longer existed within the fraternity. Dalcho passed away on November 24th, 1836. It is believed that Dalcho's first lodge was Hyram Lodge No. 2, an Ancient York Mason lodge. He is believed to have joined that lodge in 1792 in Savannah, Georgia while he was stationed there. He would go on to be affiliated with various lodges in South Carolina along with his already mentioned affiliation with the Ancient Accepted Scottish Rite.